To Cite: Vafadar S, Rouhi G. The Effects of Geometrical Parameters of the Pedicle Screw on Its Pullout Strength: In-Vitro Animal Tests, J Orthop Spine Trauma. 2017 ; 3(4):e74189. doi: 10.5812/jost.74189. Background: Pedicle screw instrumentation is one of the most commonly used forms of stabilization. Achieving solid screw fixation within the bone presents a significant challenge to spinal surgeons. Although pure pullout is not the mode of failure seen in clinical situations, pullout testing is thought to be a good predictor of pedicle screw fixation strength for spinal fusion. Objectives: To investigate the effects of varying lengths and thread depths of pedicle screws, as well as its insertion angle relative to the sagittal line on pullout strength, and stiffness of the pedicle screws and adjacent bone. Methods: Six fresh-frozen bovine lumbar vertebrae (L5) were examined. Pedicle screws with the lengths of 35, 40, and 45 mm, and the pedicle screws with thread depths of 0.9, 1.1, and 1.15 mm were inserted in pedicles by an orthopedic surgeon. Axial pullout tests were performed by a pullout apparatus and force-displacement curves were plotted. Results: The 45 mm length screw showed the maximum pullout strength (1746 N) and stiffness (564.7 N/mm) in the case of constant thread depth of 0.9 mm. The 1.15 mm thread depth screw showed the maximum pullout strength (1719 N) and stiffness (646.4 N/mm) in the case of constant length of 40 mm, and the screw insertion angle of 25° resulted in maximum pullout strength (1251 N) and stiffness (249.6 N/mm) in the case of constant thread depth of 0.9 mm and constant length of 35 mm. Conclusions: Increasing the length and the thread depth of the screws leads to an increase in the pullout strength, as well as the bone-screw construct stiffness. Pedicle screw pullout strength and the bone-screw construct stiffness were also affected by the insertion angle of the screw. There are other factors such as the insertion technique employed by the surgeon, and bone mineral density, which affect the pullout strength. Pedicle screw fixation has been demonstrated as one of the most standard treatment methods for various spinal disorders to provide rigid fixation (1). Compared to other methods, it increases fixation stability and promotes spinal fusion and healing. The selection of an ideal screw size and type is the key factor to the success of fixation, helping spine surgeons achieve the optimal fixation of spine instrumentation (1-3). Although pedicle screws are the main fixation devices for certain spine surgeries, many problems such as pedicle screw loosening, failure of vertebra after screw fixation, and screw failures have been reported (4). There are certain diseases, such as disc degeneration, which can alter the shape of the intervertebral discs (IVDs) leading to a change in the vertebra’s load distribution pattern. While using artificial discs to recover some functions of an IVD, implementation of the pedicle screw fixation may be necessary as well (5, 6). Type of screw, screw design, insertion technique followed by the surgeon, bone mineral density, and bone-screw interface can all affect the fixation strength (7-9). Results of a work by Lill and co-workers showed that compared with cylindrical screws, conical screws failed more easily by performing pullout tests (10). In contrast, Abshire et al., stated that compared with cylindrical screws, conical screws provided more fixation strength, without loss of pullout strength, stiffness or energy-to-failure, when screws were backed out 180° or 360° from full insertion (11). They also stated that the conical screws provided more engagement of the pedicle cortex and the cancellous bone at the cortico-cancellous margin than cylindrical screws (11). In another work, Tsai et al., derived the theoretical formulae to predict the pullout strength of conical pedicle screws (12). They found that the pullout strength of the pedicle screws is a function of bone strength, screw design, and pilot hole (12). Previously, Chapman et al., used an analytical formula to predict the pullout strength of cancellous/cortical screws inserted into the synthetic bone (13). Generally, cancellous screws, by decreased thread cross-sectional thickness and greater thread depth in comparison to cortical screws, are designed to provide more holding power in material like cancellous bone (13, 14). They investigated factors that affect the pullout strength of cancellous bone screws, and showed that the larger outer diameter of the screw provides greater holding power (13). The bone-screw interface is the crucial part affecting the pullout strength of pedicle screws. Hsu et al,. reported that conical screws, by compacting the cancellous bone at the cancellous-cortical interface throughout the pedicle, can improve thread purchase, and as a result, pedicle screw fixation (15). A finite element (FE) study by Matsukawa et al., showed that pullout strength enhances significantly with increasing both screw diameter and length (16). Varghese et al., in a FE study, investigated the effect of the number of threads, outer diameter, and thread geometry on pullout strength of pedicle screw in a synthetic osteoporotic bone model, and they found that the outer diameter has the highest effect on pullout strength of the pedicle screw (17). Zhang et al., who used the FE method, indicated that a larger outer diameter, longer insertion length, and smaller pitch could increase the pullout strength significantly (8). On the other hand, Chao et al., surprisingly stated that pullout strength is higher in screws with a smaller outer diameter (18). In another study, Fakhouri et al., showed that the screw with a smaller outer diameter had lower pullout and higher shear stress, suggesting that thinner screws are more susceptible to loosening (19). In a FE study by Chatzistergos et al., it was concluded that the major parameters influencing the pullout force is the outer diameter and the purchase length of the screw, and the dependence on the thread depth and pitch was significantly weaker (20). On the other hand, Lai et al., tested pedicle screws under fatigue loading in osteoporotic vertebrae and found that larger diameter screws exhibited more pullout strength immediately after the implantation, however, after fatigue loading, both sizes of screws exhibited comparable pullout strength (1). 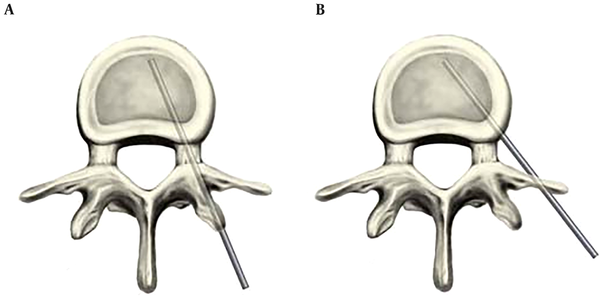 They have indicated that the smaller diameter screws may be considered for surgical techniques performed on osteoporotic vertebrae for reduced risk of pedicle breakage without sacrificing fixation strength (1). Krishnan et al., showed that increasing screw insertion angle reduced the pullout strength of a single screw configuration in both extremely osteoporotic and normal bone model (2). Barber et al., concluded that paired pedicle screws at 30 degrees of convergence offered more resistance to axial pullout and sustained higher loads at the clinical threshold of loosening compared with paired pedicle screws placed in parallel (21). However, Sterba et al., reported that the straight or parallel screw (parallel to the midline sagittal line) is a more stable construct compared to the angled inserted screw when subjected to caudal cyclic loading (22). Also, a study by Amirouche et al., indicated that screw pullout force is positively correlated with material density and negatively correlated with insertion angle (23). Despite existence of numerous papers related to the effects of pedicle screw’s geometrical parameters on its pullout strength, there are no complete unanimity on using the optimal structure and geometry of pedicle screws in spinal instrumentation. The purpose of the current study was to investigate the effects of varying lengths and thread depths of pedicle screws, as well as its insertion angle relative to the sagittal line on pullout strength of the pedicle screws, using animal vertebrae and in-vitro tests. The pedicle screws in this study are made of Ti-6Al-4V alloy and they are conical core and self-tapping. These pedicle screws with fixed heads were in the following configurations: the lengths of 35, 40, and 45 mm, thread depths of 0.9, 1.1, and 1.15 mm, and the two different insertion angles of 15° and 25° relative to the sagittal line. Moreover, the pitch and thickness of their threads were 2.75 mm and 1.5 mm, respectively. Six fresh-frozen bovine lumbar vertebrae (L5) were employed in the pullout tests. The vertebrae were harvested, stripped of soft tissues, and kept in a freezer at -20°C. Each vertebra was thawed overnight to the room temperature before testing. At first, bones were kept at 4°C and then at room temperature of 25°C (11). The screws were inserted in pedicles with the intrapedicular method (Figure 1) by an experienced spine surgeon in the hospital operating room. In all cases, insertion angles to the vertebrae were maintained at 25° relative to the sagittal line (Figure 2). Pullout test was performed in accordance with the requirements of ASTM F543 (Figure 2) (24). The pullout tests were performed using a Zwick/Reoll Hct 400/25 dynamic testing machine. Axial pullout strength was obtained as the peak force before any negative deflection on the force-displacement curve (25). In the last step, the screw with a thread depth of 0.9 mm and a length of 35 mm inserted with an angle of 15° relative to the sagittal line and was put under pullout test. The threaded sections of screws were inserted fully into bones. After pullout tests, force-displacement curves were drawn to compare pullout strength of the screws with different lengths, thread depths, and different insertion angles, separately. Also, another biomechanical parameter of interest is the pullout stiffness, which is the slope of the linear part before the yield point in a pullout test, the elastic region, of the force-displacement curve. As it can be seen in Figure 3 and Table 1, among all screws with the same thread depth of 0.9 mm, but different lengths, the screw with the length of 45 mm had the greatest pullout strength (1746 N) and pullout stiffness (564.7 N/mm). Among screws with the same lengths, i.e. 40 mm, but different thread depths, the screw with the thread depth of 1.15 mm had the maximum pullout strength (1719 N) and pullout stiffness (646.4 N/mm). Moreover, comparing two insertion angles of screws relative to the sagittal line, the screw with the insertion angle of 25° showed greater pullout strength (1251 N) and pullout stiffness (249.6 N/mm). Figure 3. Force-displacement curves for vertebra-pedicle screw construct with: A, screw lengths of 35, 40, 45 mm, and the thread depth of 0.9 mm; B, thread depths of 0.9, 1.1, 1.15 mm, the length of 40 mm, and insertion angle of 25°; C, the screw insertion angle of 15° and 25° relative to the sagittal line, 35 mm length, and 0.9 mm thread depth. Figure 4 Shows the pullout strengths of the pedicle screws recorded in various tests. Figure 4. Pullout strength of pedicle screws with: A, various lengths, thread depth of 0.9 mm, outer diameter of 5.5 mm, and insertion angle of 25°; B, various thread depths, length of 40 mm and insertion angle of 25°; and C, two different insertion angles, length of 35 mm, and thread depth of 0.9 mm and outer diameter of 5.5 mm. Pedicle screw loosening is a common problem, especially for osteoporotic vertebrae (15). In fact, stress shielding and the following imbalanced bone remodeling process could result in screw loosening (27). In order to prevent stress shielding, sufficient levels of mechanical stimuli must exist in the bone in the vicinity of an implant. Haase and Rouhi used a finite element analysis to compare the mechanical stimuli transferred to bones due to a change in screw parameters (28). They indicated that screws with a smaller outer diameter and angled threads increased stimuli transfer to the bone, and as a result, increased pullout strength, when both stress and strain energy density were considered. Reducing the screw’s elastic modulus caused an increase in stress transfer to the bone, however, strain energy density was decreased, which was unexpected and suggests that there may be complex patterns of different mechanical stimuli resulting in these consequences (28). Also, Rouhi et al., investigated the effects of various engineering designs of bone screws on stress shielding and screw loosening using a two-dimensional finite element study and showed that by increasing the outer diameter of the screw and the number of threads, the likeliness of screw loosening decreases (27). The pullout force of pedicle screw and bone-screw construct’s stiffness can be used to evaluate the maximum load at failure and the rigidity of bone-screw construct, which shows the resistance to deformation, respectively. There are several reports on enhancing the pullout strength of pedicle screws by increasing the length or outer diameter of the screw, increasing the thread depth, covering screw with hydroxyapatite, and using bone cement in case of severe lacking of bone density (29, 30). Also, several researchers have reported a strong effect of bone mineral density on screw fixation strength (31-33). Due to the anatomic constraints for increasing the screw’s diameter, a better method to improve pedicle screw fixation is used for expanding pedicle screws, which may improve bone fixation by increasing the screw tip diameter, enabling greater bone contact with no increase in pedicle insertion diameter (34). In addition, augmenting the screws with polymethylmethacrylate (PMMA) cement could immediately increase the screw pullout strength; however, it is an exothermic polymer, which may cause thermal bony necrosis and neural injury (35, 36). It should be noted that since the geometrical parameters of the screw are related to each other, it is difficult to investigate the effect of each one separatel; thus, making rough comparisons of various researchers’ results does not yield solid outcomes and may not even be logical. Results of this study showed that the pullout strength was higher in a screw with a greater length (see Figures 3A and 4A). By using a screw with a greater length, there will be a greater contact area and the bone-screw interface, allowing more friction between the screw surface and neighboring bone, and thus, a greater pullout strength will be resulted. Similarly, by increasing the thread depth, pullout strength increases (see Figures 3B and 4B). Due to the limitation in the size of pedicle region, by increase in screw size, there is a potential risk of neurologic or vascular injury due to perforation of the pedicle and the anterior wall of the vertebra by screw insertion. Additionally, screw-bone construct’s stiffness is higher for a screw with a greater thread depth and length than those with smaller thread depths and lengths (see Table 1). Moreover, it was also shown that the screw, which was inserted at a greater angle relative to the sagittal line, i.e. 25°, offers a higher pullout strength and stiffness than the insertion angle of 15° (see Figures 3C and 4C). The bone-screw interface is the decisive factor affecting the pullout strength of pedicle screws. Regional variation in vertebral bone density and the amount of bone-screw interface contribute to the differences in the pullout, as well as stiffness among different screw insertion angles. It should be noted that the insertion angle is bounded by the size and orientation of the pedicle, and it cannot be limitlessly increased. Additionally, in the case of the insertion angle of 25°, the bone involvement between screws will be increased compared to that of the smaller angle; thus the pullout strength would increase. A factor, which might influence results of this work, was the anisotropic nature of spongy bone, as well as non-homogenous distribution of trabeculae. Using multiaxial pedicle screws and applying dynamic load can provide a better insight into this complex problem. The single axial pullout force may not represent in-vivo physiological loading conditions. In addition to the pullout force, the screws may sustain the bending and/or torsional moments during the daily activities, which can be investigated in the future. Large variations in cadaveric bone geometrical and mechanical properties as well as the small number of samples used in this study can be deemed as some other limitations of this work. Other factors such as the thread profile, screw pitch, and bone material properties likely influence the fixation strength of pedicle screw, which can be taken into account and investigated in future studies. Moreover, one should note that, due to the aforementioned limitations and/or simplifications, solid conclusions can’t be made solely based on the results presented in this paper. Authors of this paper initially intended to do in-vitro test on a greater number of vertebrae, however, due to some constraints, making more tests were not possible. It is necessary to perform further investigations in order to be able to make solid conclusions in the future studies. The authors thank Dr. B Mirzashahi, a spine surgeon, and Mr. A Saeedinia for their assistance in preparing the specimens and insertion of the screws as well as reviewing the manuscript. Also, the authors are thankful to Attila orthoped company for providing their pedicle screws. 1. Lai DM, Shih YT, Chen YH, Chien A, Wang JL. Effect of pedicle screw diameter on screw fixation efficacy in human osteoporotic thoracic vertebrae. J Biomech. 2018;70:196-203. doi: 10.1016/j.jbiomech.2017.10.009. [PubMed: 29126607]. 2. Krishnan V, Varghese V, Kumar GS. Comparative Analysis of Effect of Density, Insertion Angle and Reinsertion on Pull-Out Strength of Single and Two Pedicle Screw Constructs Using Synthetic Bone Model. Asian Spine J. 2016;10(3):414-21. doi: 10.4184/asj.2016.10.3.414. [PubMed: 27340518]. [PubMed Central: PMC4917757]. 3. Mehta H, Santos E, Ledonio C, Sembrano J, Ellingson A, Pare P, et al. Biomechanical analysis of pedicle screw thread differential design in an osteoporotic cadaver model. Clin Biomech (Bristol, Avon). 2012;27(3):234-40. doi: 10.1016/j.clinbiomech.2011.10.004. [PubMed: 22071427]. 4. Kim YY, Choi WS, Rhyu KW. Assessment of pedicle screw pullout strength based on various screw designs and bone densities-an ex vivo biomechanical study. Spine J. 2012;12(2):164-8. doi: 10.1016/j.spinee.2012.01.014. [PubMed: 22336467]. 5. Akbarian D, Rouhi G, Mashhadi M, Herzog W. Biomechanics of cervical spine following implantation of a semi-constrained artificial disc with upward center of rotation: A finite element investigation. J Mech Med Biol. 2015;15(4):1550063. doi: 10.1142/s0219519415500633. 6. Kamal Z, Rouhi G. A parametric investigation of the effects of cervical disc prostheses with upward and downward nuclei on spine biomechanics. J Mech Med Biol. 2016;16(7):1650092. doi: 10.1142/s0219519416500925. 7. Varghese V, Saravana Kumar G, Krishnan V. Effect of various factors on pull out strength of pedicle screw in normal and osteoporotic cancellous bone models. Med Eng Phys. 2017;40:28-38. doi: 10.1016/j.medengphy.2016.11.012. [PubMed: 27939099]. 8. Zhang QH, Tan SH, Chou SM. Investigation of fixation screw pull-out strength on human spine. J Biomech. 2004;37(4):479-85. doi: 10.1016/j.jbiomech.2003.09.005. [PubMed: 14996559]. 9. Patel PS, Shepherd DE, Hukins DW. The effect of screw insertion angle and thread type on the pullout strength of bone screws in normal and osteoporotic cancellous bone models. Med Eng Phys. 2010;32(8):822-8. doi: 10.1016/j.medengphy.2010.05.005. [PubMed: 20558097]. 10. Lill CA, Schlegel U, Wahl D, Schneider E. Comparison of the in vitro holding strengths of conical and cylindrical pedicle screws in a fully inserted setting and backed out 180 degrees. J Spinal Disord. 2000;13(3):259-66. doi: 10.1097/00002517-200006000-00011. [PubMed: 10872766]. 11. Abshire BB, McLain RF, Valdevit A, Kambic HE. Characteristics of pullout failure in conical and cylindrical pedicle screws after full insertion and back-out. Spine J. 2001;1(6):408-14. doi: 10.1016/S1529-9430(01)00119-X. [PubMed: 14588297]. 12. Tsai WC, Chen PQ, Lu TW, Wu SS, Shih KS, Lin SC. Comparison and prediction of pullout strength of conical and cylindrical pedicle screws within synthetic bone. BMC Musculoskelet Disord. 2009;10:44. doi: 10.1186/1471-2474-10-44. [PubMed: 19402917]. [PubMed Central: PMC2694760]. 13. Chapman JR, Harrington RM, Lee KM, Anderson PA, Tencer AF, Kowalski D. Factors affecting the pullout strength of cancellous bone screws. J Biomech Eng. 1996;118(3):391-8. doi: 10.1115/1.2796022. [PubMed: 8872262]. 14. Wang H, Wang H, Sribastav SS, Ye F, Liang C, Li Z, et al. Comparison of pullout strength of the thoracic pedicle screw between intrapedicular and extrapedicular technique: a meta-analysis and literature review. Int J Clin Exp Med. 2015;8(12):22237-45. [PubMed: 26885199]. [PubMed Central: PMC4729985]. 15. Hsu CC, Chao CK, Wang JL, Hou SM, Tsai YT, Lin J. Increase of pullout strength of spinal pedicle screws with conical core: biomechanical tests and finite element analyses. J Orthop Res. 2005;23(4):788-94. doi: 10.1016/j.orthres.2004.11.002. [PubMed: 16022991]. 16. Matsukawa K, Yato Y, Imabayashi H, Hosogane N, Abe Y, Asazuma T, et al. Biomechanical evaluation of fixation strength among different sizes of pedicle screws using the cortical bone trajectory: what is the ideal screw size for optimal fixation? Acta Neurochir (Wien). 2016;158(3):465-71. doi: 10.1007/s00701-016-2705-8. [PubMed: 26769471]. 17. Varghese V, Kumar GS, Venkatesh K. A finite element analysis based sensitivity studies on pull out strength of pedicle screw in synthetic osteoporotic bone models. Biomedical Engineering and Sciences (IECBES), 2016 IEEE EMBS Conference. IEEE; 2016. p. 382-37. 18. Chao CK, Hsu CC, Wang JL, Lin J. Increasing bending strength and pullout strength in conical pedicle screws: biomechanical tests and finite element analyses. J Spinal Disord Tech. 2008;21(2):130-8. doi: 10.1097/BSD.0b013e318073cc4b. [PubMed: 18391719]. 19. Fakhouri SF, Zamarioli A, Wichr CRG, Araujo CA, Defino HLA, Shimano AC. Biomechanical study of the pullout resistance in screws of a vertebral fixation system. Adv Mech Eng. 2015;3:701263. doi: 10.1155/2011/701263. 20. Chatzistergos PE, Magnissalis EA, Kourkoulis SK. A parametric study of cylindrical pedicle screw design implications on the pullout performance using an experimentally validated finite-element model. Med Eng Phys. 2010;32(2):145-54. doi: 10.1016/j.medengphy.2009.11.003. [PubMed: 19945333]. 21. Barber JW, Boden SD, Ganey T, Hutton WC. 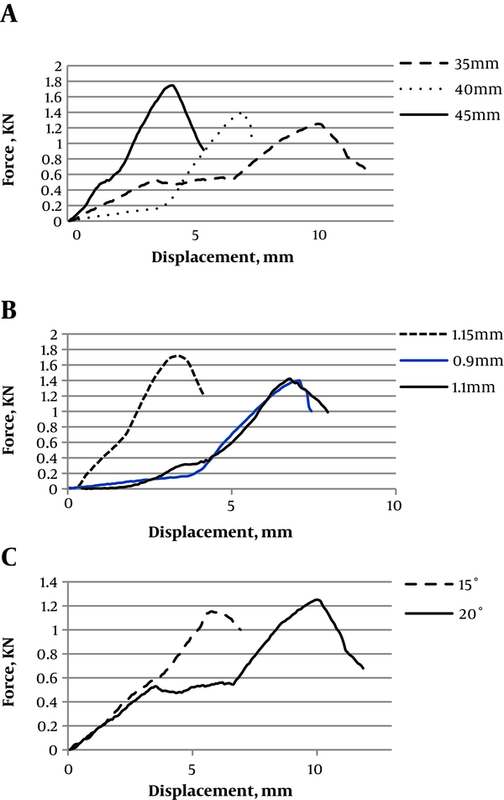 Biomechanical study of lumbar pedicle screws: does convergence affect axial pullout strength? J Spinal Disord. 1998;11(3):215-20. doi: 10.1097/00002517-199806000-00007. [PubMed: 9657546]. 22. Sterba W, Kim DG, Fyhrie DP, Yeni YN, Vaidya R. Biomechanical analysis of differing pedicle screw insertion angles. Clin Biomech (Bristol, Avon). 2007;22(4):385-91. doi: 10.1016/j.clinbiomech.2006.11.007. [PubMed: 17208340]. [PubMed Central: PMC1924916]. 23. Amirouche F, Solitro GF, Magnan BP. Stability and Spine Pedicle Screws Fixation Strength-A Comparative Study of Bone Density and Insertion Angle. Spine Deform. 2016;4(4):261-7. doi: 10.1016/j.jspd.2015.12.008. [PubMed: 27927514]. 24. Standard A. F543-07 ε1: standard specification and test methods for metallic medical bone screws. West Conshohocken, PA, USA: ASTM International; 2007. 25. Allen R, Baldini N, Donofrio P, Gutman E, Keefe E, Kramer J. Standard test method for determining axial pull-out strength of medical screws (F1691-96). Annual Book of ASTM Standards medical devices and services. 13. 1997. 26. Winn HR. Osteoporotic fractures: Evaluation and treatment with vertebroplasty and kyphoplasty. In: Crowley RW, Yeoh HK, Mckisic MS, Oskouian RJ, Dumont AS, editors. Youmans Neurological surgery. Philadelphia: W. B. Saunders Co; 2011. p. 3255-67. 27. Rouhi G, Tahani M, Haghighi B, Herzog W. Prediction of stress shielding around orthopedic screws: Time-dependent bone remodeling analysis using finite element approach. J Med Biol Eng. 2015;35(4):545-54. doi: 10.1007/s40846-015-0066-z. 28. Haase K, Rouhi G. Prediction of stress shielding around an orthopedic screw: using stress and strain energy density as mechanical stimuli. Comput Biol Med. 2013;43(11):1748-57. doi: 10.1016/j.compbiomed.2013.07.032. [PubMed: 24209921]. 29. Zindrick MR, Wiltse LL, Widell EH, Thomas JC, Holland WR, Field BT, et al. A biomechanical study of intrapeduncular screw fixation in the lumbosacral spine. Clin Orthop Relat Res. 1986;(203):99-112. [PubMed: 3956001]. 30. Chazistergos P, Ferentinos G, Magnissalis E, Kourkoulis S. Investigation of the Behaviour of the Pedicle Screw-Vertebral Bone Complex, When Subjected to Pure Pull-Out Loads. 2006 International ANSYS Conference Proceedings Pittsburgh. USA. ANSYS Inc; 2006. 31. Coe JD, Warden KE, Herzig MA, McAfee PC. Influence of bone mineral density on the fixation of thoracolumbar implants. A comparative study of transpedicular screws, laminar hooks, and spinous process wires. Spine (Phila Pa 1976). 1990;15(9):902-7. [PubMed: 2259978]. 32. Halvorson TL, Kelley LA, Thomas KA, Whitecloud T3, Cook SD. Effects of bone mineral density on pedicle screw fixation. Spine (Phila Pa 1976). 1994;19(21):2415-20. [PubMed: 7846594]. 33. Seebeck J, Goldhahn J, Stadele H, Messmer P, Morlock MM, Schneider E. Effect of cortical thickness and cancellous bone density on the holding strength of internal fixator screws. J Orthop Res. 2004;22(6):1237-42. doi: 10.1016/j.orthres.2004.04.001. [PubMed: 15475203]. 34. Cook SD, Salkeld SL, Whitecloud T3, Barbera J. Biomechanical evaluation and preliminary clinical experience with an expansive pedicle screw design. J Spinal Disord. 2000;13(3):230-6. doi: 10.1097/00002517-200006000-00006. [PubMed: 10872761]. 35. Sturup J, Nimb L, Kramhoft M, Jensen JS. Effects of polymerization heat and monomers from acrylic cement on canine bone. Acta Orthop Scand. 1994;65(1):20-3. doi: 10.3109/17453679408993711. [PubMed: 8154277]. 36. Kuhns CA, Reiter M, Pfeiffer F, Choma TJ. Surgical strategies to improve fixation in the osteoporotic spine: the effects of tapping, cement augmentation, and screw trajectory. Global Spine J. 2014;4(1):47-54. doi: 10.1055/s-0033-1361588. [PubMed: 24494181]. [PubMed Central: PMC3908976].